In my time working with Atava and her classes at Ancestral Apothecary I have grown and healed in ways that were always just out of reach but became firmly the center of my attention and love. Atava is gifted with a true connection to the plants and is a talented teacher, centering the power of the student to heal themselves, and the innate wisdom of each of our bodies. As an herbalist, Atava’s ability to talk between and through the scientific, the spiritual, the personal and political is unmatched. Thank you to Atava and your ancestors for sharing your gifts. I have had years of solitary and group study and found home at Ancestral Apothecary. The classes are nurturing, informative and transformative. They offer a wealth of knowledge and a path with heart. The community of plants, teachers, ancestors and wise cohorts co-create a healing space that carries and nurtures me through the week until the next class. I am engaged at all levels and thankful to Atava for making this possible. My life is better for it! Atava’s program is unique; one that engages the spirit, heart and hands. Rather than communicating a dogma on the plants and spiritual practice, Liz and Atava offer guidance to develop a relationship with one’s indigenous self, traditions and ancestors. It is from here that authentic education about healing takes root. 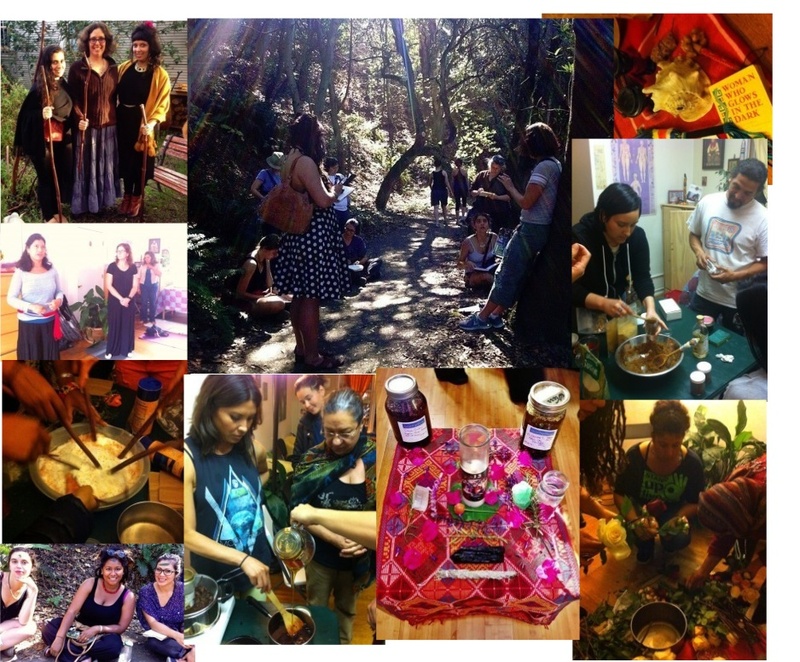 Mi Cuerpo sagrado offers a healing community to folks who wish to use herbs, flowers, movement, and meditation for self-care and social change. I loved it! I’m new to herbalism and taking formal classes about traditional and herbal medicine. But starting this journey was deeply personal and political for me – it’s a part of reclaiming my connection to the natural world and to our traditional ways of healing. It’s connected to a political intention of transforming out of the current capitalist system, and it’s connected to a personal intention of returning to my ancestral roots and identity. So, because of all of that, who I learned from and how I learned it was very very important. Ancestral Apothecary is uniquely and powerfully upholding deep integrity around the spiritual, political, and personal intentions of passing on the wisdom of herbal medicine. Existing outside of institutional academia, rooted in the local Oakland community, and intentionally offering support to young people of color who can’t afford other types of classes – Ancestral Apothecary reflects the integrity and the intention that I seek in this type of learning. I’ve been studying herbology with Atava García Swiecicki for over a year. To say that my experience has been amazing would not give justice to what Atava offers to the world. Her teachings go beyond the mere intellect and connect us to a deeper part of ourselves that is missing in today’s health care system. This in itself is revolutionary and, what I would call, a holistic approach to self-care. Atava’s teachings invite us to explore not only the physical, but that which can only be felt, sensed, and perceived; helping us to connect to what we all seek: a deep and profound relationship with nature, ourselves, and each other. Our classes become a beautiful ritual where our innate wisdom is freed to unravel and flourish so that we can transform and heal. In the process, we find our voices, our roots, our strength, and we realize our responsibility and our potential to help others and our communities heal and transform. sweet. flowing love. the essence of a flower & whale dancing with water. roses. shadow. light. recovery. grounding ginger. replenishing fire. moving into ourselves again and again. This class blossomed with a gentle and deep holding of ancestral love and healing. It affirmed the soothing possibilities of sharing space to honor our energies, hearts, spirits, bodies, rituals, and plants. Gratephool for how it encouraged me to become even more intimate with myself and to hold, heal, and invoke ancestral memories and wisdoms with care and intention.